Mass transit in central Indiana took one-half step forward, and what some might say one-fourth of a step back. The Senate Tax and Fiscal Policy Committee approved a bill that would allow for expanded mass transit in Marion, Hamilton, Johnson, Delaware, Madison, and now Hancock counties. The funding structure proposed by last year’s Summer Transit Study Committee is what helped the bill get passed this time. Voters in each county would have to approve an income tax increase of anywhere from 0.1 to 0.25 of a percent increase, which would fund 65 percent of the operating costs. Corporations would have to pay 10 percent of the cost and fares would have to cover 25 percent of the operating costs. This tiered financial structure requires that all parties involved take responsibility by investing in a system that those same parties will benefit from. The portion of the amended proposed bill that seems slightly puzzling is that light rail is banned and state funds may not be used for any expansion. The opposition to light rail is puzzling because one would think that if voters are able to decide whether or not to raise their income taxes, surely they are able to decide what mode of transit best suits their needs. Although the decision about what type of transit system to build is to be left to each county, one type of transit has already been banned. Why the war against rail transit? After all, it’s not too foreign of a concept here. Two and a half weeks out of the year rail transit is used to transport passengers from Fishers to the Indiana State Fairgrounds multiple times per day. Many would argue that rail transit is too expensive and there isn’t a dense enough population to support it here in central Indiana. However, other cities around the U.S. with populations similar to those here in the Indianapolis metropolitan area have seen rail transit work and reaped the development benefits from it. The line proposed by Indy Connect initially to be serviced by light rail is along that same fair train route mentioned earlier. The green line will go between 176th street in Noblesville to downtown Indianapolis via Fishers and various Indy neighborhoods. Below is a comparison of Hamilton County with other suburban counties with rail transit. Each of the latter three suburban counties has a low population density similar to that of Hamilton County. Both Nashville and Salt Lake City, the major cities in which the Music City Star and FrontRunner North terminate, have populations of 626,681 and 189,314 respectively. Both cities have a population density of 1,200 and 1,666 respectively. Given, the latter three lines have been classified as commuter rail as opposed to light rail, each line was built on an existing rail right of way and each makes at least one stop in the major city in which they terminate. For these counties and the major metropolitan cities to which they are connected, citizens were allowed to vote on a tax increase of some sort, be it sales or income, and developments continued from there. Indiana state legislators have told central Indiana citizens that no matter what, their tax dollars won’t be used for light rail, not even if they wanted it. In these efforts, similar to parents telling their children what they can and cannot buy, legislators did not give a reason why. Sure, some said it will give the project a better chance to succeed, and others said the cost would be entirely too much. Indy Connect planners have said in meetings that the estimated cost of the green line is a high end estimate, and the amount could be significantly lower than that in the end. Many rail plans have been completed under budget, the FrontRunner project being one of them, which was estimated to cost $550 million. Regarding funding, one important factor to remember is that amount of the initial investment costs to be covered by the Federal Transit Administration is yet to be determined. The FTA’s New Starts program helps funds new and existing transit projects including commuter, light, and heavy rail, as well as bus rapid transit, streetcars, and ferries. Therefore, people must understand that the local portion of funding can’t be based off of the initial estimated cost alone, as federal funding will help subsidize that amount as well. Indy Connect planners originally stated that the expansion would be funded by federal, state, and local dollars. Well the federal part is still on board, as the FTA has already helped fund the initial studies. The local part has not been given the chance to vote yet, but when they do, they know rail transit won’t be an option. The state, however, will not be funding any of this. Should transit supports be upset? Well, the same thing happened in Georgia, and to date Atlanta’s MARTA is the largest mass transit system in the U.S. not to receive state funding for operational expenses. In spite of a budget crisis 4 years ago, it still maintains a high ridership of 227,300 rail passengers per day. If the state of Indiana doesn’t want any funding to go to mass transit in the Indy-metro area, that’s fine. However, why should funding go to mass transit in other areas of the state? Currently, the Public Mass Transportation Fund, the Commuter Rail Service Fund, and the Electric Rail Service Fund are dedicated funding programs. The PMTF comes from 0.67 of one percent and the CRSF comes from 0.123 of one percent of sales and use taxes collected statewide. The only district eligible to receive the ERSF and the CRSF is the Northern Indiana Commuter Transportation District, operator of the South Shore Line. The line also receives 12.34% of the total PMTF amount available annually. Even with BRT, the expansion would still qualify for the PMTF under the purpose for which the fund was created. Perhaps, when the Senate committee said “no state funding”, they forgot about these sources and therefore didn’t really mean what they said. If that is the case, hopefully more time won’t be taken from pushing this measure forward by stalling it in another committee just to correct the financial jargon. However, if that were to happen, the train would at least be upgraded from going nowhere to just being delayed. Would INDOT be contributing anything under the current administration, anyways? It’s really hard to do huge capital transit projects like this with $0 from the state. That’s why Chicago is so far ahead and why the Cincinnati streetcar almost died. The whole state can pay for Lucas Oil Field but that that same model somehow doesn’t work for transit, doesn’t make sense but what does to the GOP. Eliminating the potential for rail from the plan is just more micromanagement by the Legislature. Again…they forget that Central Indiana is THE engine (pun intended) pulling the state forward. I say this is much ado about nothing. Get the bill passed and then on to the referendum. If it passes and a case can be made for light rail, then go to the legislature and get the light rail retracted. If it passes and light rail is more cost effective, it will fly. But would that then require another referendum to reinsert the possibility of LRT? i feel the federal g. will make sure that metro indy get a light rail system being that its the second largest city in the midwest, thats on a steady population spree. How in the world did Hancock County get thrown into the mix? 2. It will constantly need maintenance and will never pay for itself. When you say it doesn’t pay for itself are you speaking in terms of return on investment? Recouping operating costs? A study last year showed that the Portland blue line attracted the biggest real estate investment of any surface light rail transit system in the U.S. Portland’s streetcar has seen a $41 return per dollar spent on its system. The blue line in San Diego had a farebox recover ratio of 76.4%. Can you clarify? The link regarding Portland seems to say the BRT line in Cleveland was 31 times more cost effective than the blue line in its study. San Diego is the highest on the graph shown, what about the other cities? Is LA a failure because it’s at 21 percent? Worth checking out: “After adding $1.2 billion worth of new rail lines in the past year, the Utah Transit Authority projected that its overall ridership would be growing. Instead, it dropped or remained flat…” etc. How’s Phoenix doing, San Jose, Honolulu? Reasonable people may disagree but some skepticism of a light rail project in Indy seem warranted. Yes, Cleveland’s BRT has proven to be extremely successful, and I would hope that our proposed BRT lines can be put in a position to perform similarly. My point was that if we already have an existing right of way, that has a form of passenger rail, albeit as an attraction a few times out of the year, why not make the most out of that corridor with light rail. LRT and BRT are both good, and BRT will be great for the proposed blue, red, purple, and orange lines. But let’s remember, that the return on investment for BRT depends on how close the line is to the gold standard of BRT. Regarding Utah, a lot of the ridership dropped due to construction, and scheduling changes. One thing to consider for the FrontRunner project specifically is that it was projected to be complete in 2015. And in many studies, ridership was based off of those future projections. Therefore an accurate assessment of how well the line is doing can’t really be assessed until the 2015 when the project was expected to be completed. Also, it appears the entire system has had periodic ridership gains through the latter half of 2013. I believe what it all comes down to is planning. There have been enough financial stipulations written into the transit bill that I don’t see how it could end up over budget. Also, lines have to be constructed in a way that can garner a sufficient return of investment. Look at the Kansas City streetcar, and it’s not even here yet. I’m wondering if the amendment excluding light rail only precludes light rail specifically but not other forms of trains. If I recall, the Connections and Directions studies rated DMU rail higher than LRT. DMUs are essentially large diesel buses on rail… They combine many of the positive characteristics of trains and busses at an affordable price. The big cost savings is not having to build the expensive electric catenary. Well if the bill specifically says light rail, this minor loophole would be a way around it. But with the fact that the line is to continue onto the streets once it reaches 10th street, I’m not for sure how well this would work. It might look like this, minus the catenary lines. Guy77money, surely you realize that streets also constantly need maintenance and will never pay for themselves. Not to mention the negative externalities that everyone forgets about when doing a cost analysis for commuting via car vs. mass transit. And while light rail does indeed move people, and not commerce, since we are in a service economy the movement of people might be pretty important. Have you heard about the bus downtowner! Much cheaper and it puts you right at your front door! Spend the money on nice luxury bus transportation with good police protection then everyone wins! When I mean everyone I mean the poor, middle class and the upper class. Throw in the north, south, east, west and inner city riders and wow a billion dollars moves a lot more people much more efficiently. Light rail is s0 inefficient I can’t believe you people keep pushing it! They do pay for themselves dude! Sure moving people is important! But a billion dollars to move about 2 percent of the population. Light rail is so 19th century technology! Get on the Google band wagon with self driving cars! I stopped by a north side hospital ( I’m in my 50’s) and I was at the wrong building. The nurses who all looked in great physical shape said I should drive the .2 miles to the right building. I was shocked I told them I would walk over to the building in the snow. If you haven’t figured it out most people in Indy are god awful lazy! How many are going to walk a 1/2 mile in the cold to get to their office building? Not many which is why the warmer climates do better for light rail. Doesn’t matter, as it won’t pass in any of the donut counties! We don’t want it, and won’t pay for it. If Marion County wants to upgrade Indygo, cool, but leave the donut counties out of it. Well once it goes to a referendum, the citizens of the donut counties will have a chance to vote it down if they truly don’t want it. However, I don’t think we can lump all of the donut counties together since citizens and elected officials from Hamilton, Madison, and Delaware counties have been very vocal about their desire for mass transit. And I guess now Johnson county since they have been inserted into the bill. Just remember to temper your dreams because it’s going to end up being a Marion County only system. Politico’s like having the option for their constituents to join, but there is no way it passes in the donut counties. Traffic just isn’t bad enough to justify a tax increase for most commuters to cover a mass transit system. It’s not just about traffic congestion or lack thereof for the mayors in Hamilton county. According to the Noblesville Mayor…. Mayors don’t pay all of the income taxes that their constituents are being asked to pay. The only reason the school referendums passed was because link between top notch schools and residents property values was laid out crystal clear. Top quality schools help preserve your home’s value or so the argument went. There isn’t that argument here, so the same voters that approved the referendums for schools have no reason to vote for a system they aren’t going to use. Ever hear of “The Main Line” (rail suburbs of Philadelphia), Dingo? It’s a place of high property values and better public schools than in any of Indy’s suburbs. Plus commuter and light rail. And that is Philly a much larger city that has traffic issues, which Indy doesn’t have. The burbs don’t want or need mass transit so you guys can sit on here dreaming about how cool it will be but you’re going to end up like the main character in the movie “Singles” with his supertrain concept that gets told that people just like their cars too much. The burbs will not pay for it. If this passes out of the Statehouse and goes to a referendum it will be a landslide loss in the donut counties. I agree with this comment 1000%. I love the Monon trail, but that would have been by far the best route for an initial transit line. Yeah it goes through some dense parts of town, but mostly back yards and away from existing infrastructure, development, commercial nodes, etc. I imagine the route could hypothetically serve as a decent commuter rail option (higher speeds, limited stops, etc) for Broad Ripple, Carmel, and points beyond. Probably the wrong problem to be solving though. So, if I understand correctly, you’d prefer that the eyesore and dumping ground known as the abandoned Monon Railroad right-of-way should have been left to deterioriate over the course of the past 15+ years? Would that really have been preferable to installing a linear park that has created additional value for adjacent residential property values? I’m not so sure that would be the case if a LRT line was in the back yard. 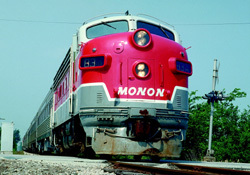 Further, the Monon Trail stimulated Carmel redevelopment w/ the trail as the centerpiece, spurred the development of other railtrails in the state and provided an attractive invitation for citizens to get off their duffs and get active. Oh, and don’t forget the Cultural Trail which Brian Payne has said many times, was inspired by his riding the Monon Trail w/ his son and coming to an uninspired 11th street terminus. Establishing the Monon Trail was a smart investment that continues to pay dividends for the entire community. I don’t think you meant to reply to me, because I agree with you. IMO the creation of the Monon Trail was absolutely a fantastic move and serves its community much better than a transit line would in the same location. that are important to them” (Wardrip, 2011). Ever been to Milwaukee, Chicago and Frisco. Ask the people that work in the downtown area and cities how good their bus systems works. The bus system moves more people and upping the stops, maintaining passenger safety, building nicer shelters, making them user friendly with technology and making then more appealing cost way less then a light rail system that moves no more then 2 percent of the population. As my previous post indicate it puts people on their door steps of work and home and keeps people from walking long distances in the cold and snow to arrive at their work place. Did I mention light rail is fixed stops and so 19th century thinking when it comes to moving people from place to place. I don’t think anyone here has ever refuted the fact that a well structured bus system is needed to support any time of rail system. That’s what the Indy Connect plan includes, an expanded bus system, bus rapid transit, and what was going to be just one light rail line. Let’s keep that in mind. Out of 5 rapid transit lines, only one was proposed as light rail. Yes light rail and BRT are composed of fixed stops. The purpose of fixed stops is to get people from point A to point B quicker. Also, when you say “light rail system that moves no more than 2 percent of the population”, are you saying that LRT only moves 2 percent of transit riders? Or that it only moves 2 percent of a city’s total population? Because if it’s the latter, I think 2% would be a very low end estimate. I found a list that shows transit ridership by percentage per city. Then there’s the report from the APTA regarding last year’s totals. I randomly took the totals from July ’13 LRT, added to the bus totals of July ’13, and then divided LRT into that total and got 9%. But that is out of the whole U.S. and not by city. I forgot the time variable. How many people have an extra hour in their day to walk or drive to the train station and then walk to their work place. Factor in people with school age kids and jobs with non flexible hours. Light rail doesn’t work up north since it will only move people to the center of the city. You will still have to drive to get to the train station. My brother who lives in Carmel said it would take him more time to drive to a train station and I suspect pay for parking to take a train downtown then it would to drive downtown. Then who is going to watch his car to make sure someone doesn’t steal it or vandalize it. Its a big problem in Chicago. Stop romanticizing about light rail and get on the bus train! Has anyone done a study to see if good efficient, safe, etc, bus systems cause economic development and property incomes to go up? It’s just moving people from point A to point B and doing it way more efficiently. Of course not developers love the romance of the rail system. Not to mention the political corruption and over run costs that come with large public works projects. If you stagger employees and students start and stop times by 15 minutes (IUPUI, Wishard, IU Hospital and Lily’s come to mind) it would lighten the problem of traffic congestion by the same amount as a light rail system. SO come of people tell me where a light rail system trumps a good bus system. Disappointed to see a progressive blog such as Urban Indy plagiarizing the work of others. The photo titled, “Fair Train at Fishers Station” is mine and I have all copyright protections applied to it. Please remove it immediately since I am not credited for the photo nor was my consent sought before it was used. I would be more than happy to let Urban Indy use my photos in the future, but I must give my consent first and would like to be credited for the work. I apologize. I saw it on google images and I should have referenced that in my post. Just finished reading this article. We “old-timers” have known Indianapolis as Naptown for rightful reasons. Indy was seldom quick to react to positive forward directions. It was easier to just accept things as is and why change. But then, some parts of city thinking changed. Several central city structures blossomed higher, bigger and better than the former iconic Indiana National Bank building, at one time the tallest building in Indiana. Today, Lucas Oil Stadium was built, NCAA headquarters relocated, IUPUI became a Division One school and remains today still undefeated in football. So, why not continue to move to center, get cars off the road and folk into commuter trains? Huge benefits despite heavy start-up costs. The study to move forward should not only look at the Carmel/Noblesville terminus, but Martinsville/Mooresville, Danville/Avon and Shelbyville connections to Indy Central. Benefits outway costs and thinking should beyond dimes and dollars. I read a note from one responder that he might have to “walk” the final distance to his office, more than the closer parking deck one block away. Wow; maybe a 10 minute walk to and from his office might add 5 more years to his life. How much is 5 more years of life worth? Please, Indy, make train commute work. Get it started then build on improvements to make benefits outweigh costs. Thanks.